Spaghettini’s Sunday Brunch has been a Southern California tradition for over a decade. Featuring live music, delicious food, and great giveaways, it is the perfect place to relax and unwind with friends and family. 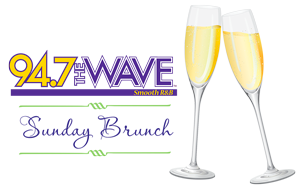 Join us every Sunday as 94.7 THE WAVE broadcasts live from the Entertainment Lounge! To enjoy brunch in the Entertainment Lounge you must purchase tickets in advance at spaghettini.tix.com or by calling 1-800-595-4849. The $60 for brunch will be charged separately in the restaurant on the day of the event. Purchasing Brunch is required for all guests. Your ticket purchase will hold as your reservation, so there is no need to reserve online or by calling the restaurant.